Actors Tatsuya Fujiwara, former KAT-TUN member Koki Tanaka and comedian Ryuichi Kosugi star in the comedy film "Sanbun no Ichi" (One-Third). Fujiwara plays as the manager of the hostess club called "Honey Bunny", Tanaka as his club waiter named 'Koji' and Kosugi as 'Ken-san', the club regular. 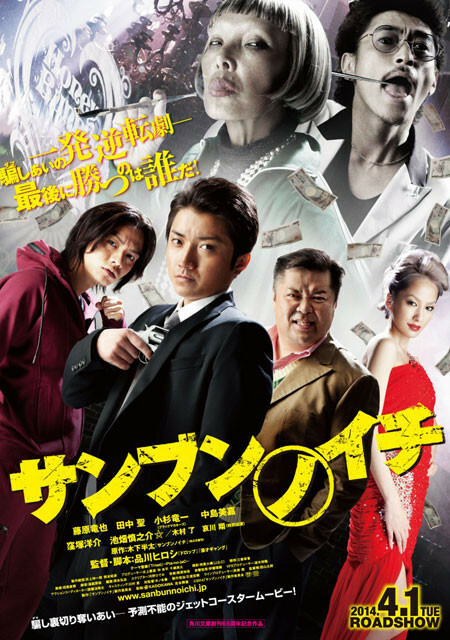 Based on Hanta Kinoshita's 2012 novel, the film tells the story of the trio who robbed a bank successfully. They are supposed to take equal shares of the stolen money but they later became greedy as they start to bargain and entrap each other. In addition, singer/actress Mika Nakashima will join the cast as a bar hostess and later gets involved in the scene. Directed by Hiroshi Shinagawa, "Sanbun no Ichi" (One-Third) will hit theaters on April 1, 2014.